Durga Puja is the most important festival for Bengalis. With the festival being near your threshold, the excitement truly gets high. Though there are many other festivals which are celebrated by the Bengali community, when it comes to Durga Puja or Pujo, it is simply the best of celebrations. The celebration begins from the purchasing of new clothes which is followed by pandal-hopping, catching up with friends and much more. Bengaluru is a home away from away for many Bengalis, which makes the city get into the festive fever during the Navratri days. One can find various pandals erected at various parts of the city. Beginning from the heart of the city to the outskirts, one can at least find a dozen or more pandals in the garden city. Have a look at the must-visit ones here and decide which one you would visit first. The oldest Durga Puja pandal in the garden city which has been organising the festival for 60 odd years, is all set to kick-start this year's puja at its new venue in the MANPHO Convention Centre near Manyata Tech Park in Hebbal. Being the oldest puja pandal, the venue attracts a large number of people with almost 25,000 odd visitors through the four-day period. The pandal is well known for its theme-based decorations which sticks to the Bengali traditional values. Apart from this, the pandal also puts up a large number of multi-cuisine food stalls, clothes, automobiles, handicrafts, etc. along with performances by its members and renowned artists from West Bengal. As any other pandal, there are the usual rituals, prayers and festivities at this puja too. This venue attracts the people who are staying in the areas of Sarjapura, HSR Layout, etc. The puja here began in the year 2008 and along with the years, the pandal just kept getting bigger and better, with theatre performances, food stalls and much more. The puja is a completely green event with absolutely no plastic allowed in its venue. The puja here is organised in a kalyana mantapa; hence, the place does not have any elaborate decorations unlike the others. The major attraction here without any doubt is the idol of the goddess, which is sculpted in unique manners every year. A large number of people visit this pandal for its delicious offerings in the food stall, along with its dash of cultural events and the pushpanjali for the spiritual well-being. 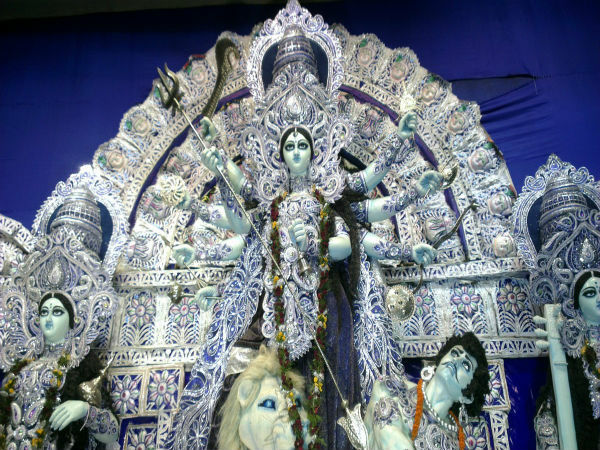 A rather young puja which turns 6 this year, it also considered as one of the biggest puja pandals in the city. The puja is organised by the Bengali community who dwell in and around Kanakapura Road and J P Nagar, it is also one of the most happening puja venues of South Bengaluru. With a large number of cultural events, food stalls and devotional services, the place is indeed one of the best and biggest venues to celebrate the festival in. This is another senior pandal which has been celebrating the festival for 60 odd years. The pandal is well known for it designs and patterns which take inspiration from various monuments and temples of West Bengal. Apart from the pandal, the most important attraction is the idol of the goddess, with a huge crown and sharp eyes she is sure to cast a spell on the visitors. There are also many food stalls, cultural events, competitions for the kids and bhog, which is served everyday.